Say dahlia pests and the gang at Lynch Creek Farm, which raises dahlias for tuber sales and bouquets, gives a collective shudder: flea beetles. Some years back, when the Farm crew was expanding its collection of dahlias for bouquets and sales of dahlia tubers, a contaminated tuber introduced flea beetles into the dahlia field. "It was awful," said Nathanael Hartman, Lynch Creek's go-to guy. "You'd go out there and the plants looked like they'd been sprayed with birdshot." While the philosophy at Lynch Creek is to use natural and organic pest control if possible, pesticides were the only way to quell the assault. Two species of flea beetle are of concern in the Northwest, the tuber flea beetle, Epitrix tuberis, and the western potato flea beetle, E. subcrinata. 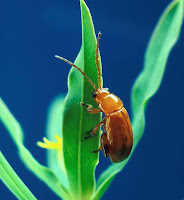 While of most concern to potato growers, flea beetles can inflict significant damage on tomatoes, cole crops (cabbages and their cousins), other vegetables, and garden flowers, particularly dahlias, coreopsis and other dahlia relatives. Description and Life History: The adult tuber flea beetle is tiny (1/16 inch long), oval, and black with reddish antennae and legs. The western potato beetle is similar in size but is shiny bronze in color. Long hind legs enable flea beetles to jump, flealike, when disturbed. The beetles spend their winters in protected places such as under garden debris and along ditchbanks. They emerge in spring and feed on wild vegetation until field and garden plants are available. They lay their tiny eggs on soil around the plants, and the small whitish larval-stage grubs feed on underground portions of the host plants, sometimes burrowing into tubers. Both larval and pupal stages are completed in the soil. There are one or two generations per year, sometimes a third. Controlling These Dahlia Pests: Fortunately, quirky Northwest weather, with alternating periods of hot and cold temperatures and intermittent rains, is sometimes a good for quelling flea beetles. Drought conditions often brings an increase in flea-beetle populations. 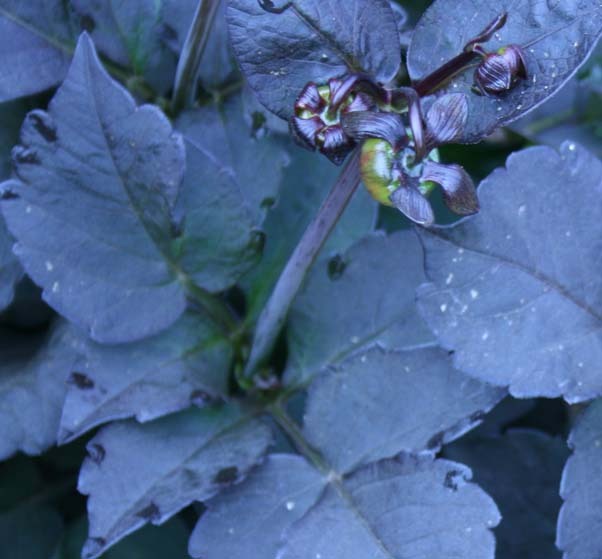 Using organic fertilizers and cover crops make gardens less attractive to flea beetles, and trap cropping with brassicas like Chinese Southern Giant Mustard or daikon radishes can lure the beetles away from your dahlias. Row covers can help protect young dahlias from beetle predation. Since adult beetles overwinter in garden debris, keeping debris and other bug-shelters at a minimum is useful. Diatomaceous earth has been used with success by some gardeners. Some gardeners recommend catnip as a preventive, but overall, it has not proved useful. Beneficial predators and parasites include Microcotonus vittage Muesebeck, a braconid wasp that reportedly kills the adult flea beetle and sterilizes the female flea beetles. Commercial formulations of entomopathogenic nematodes are reported as effective controls; they attack the beetle's larval stage, reducing root damage and helping prevent the emergence of adult flea beetles. Oils and extracts like Neem, Sabadilla, Rotenone and pyrethrins are said by some growers to be the more effective of the botanical pesticides labeled for use on flea beetles. Rotenone mixed with an oil can be very effective, and integrated dahlia pest management plans are usually better than sticking to a single approach. But it's all very depressing, all these pest descriptions, and there's not even the alternative of eating beetles, as one can do with snails. I'd planned to continue this series with dahlia viruses, but it's begun to seem so morbid, all these critters you can't get rid of without committing environmental damage. The back of my neck has begun to feel creepy-itchy, and I find myself eyeing my salad plate suspiciously, and wanting to rush out and cover the entire garden with insect-cloth. So you can plan on looking for only one more reference to dahlia pests and then we'll take a break and look at some successes and suggestions that will be a LOT more fun.